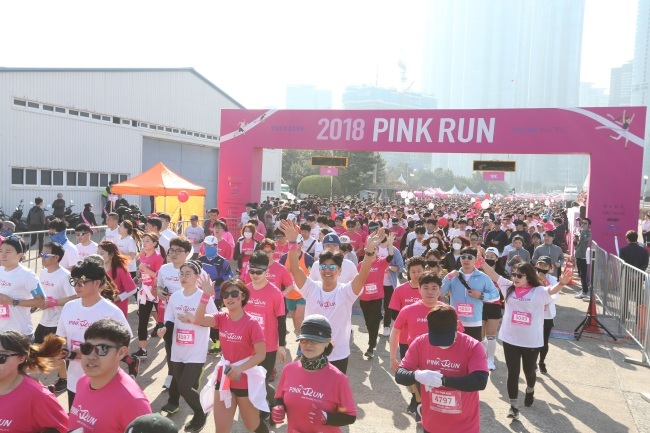 South Korean cosmetic giant Amorepacific hosted a marathon in the southern port city of Busan to raise public awareness about breast cancer, with about 5,000 participating, the company Sunday. Titled “Pink Run,” Amorepacific has been holding marathons in five cities in South Korea. Funds raised during the events, by selling tickets, have been donated to the Korea Breast Cancer Foundation to cover surgical expenses and medical examinations for patients. This year’s Pink Run had three courses -- 3, 5 and 10 kilometers -- to make the event family-friendly, the company said. Participants who finished the courses went through free breast cancer tests and clinical consulting sessions afterward. Korean actress Song Hye-kyo, who represents Sulwhasoo, a cosmetic brand by Amorepacific, also attended the event to deliver her donation for breast cancer patients. “A regular test is a must as the breast cancer cure rate hovers around 90 percent if detected in the early stage,” said Noh Dong-young, president of the Korea Breast Cancer Foundation. Last year, the company announced a corporate social responsibility project titled “20 by 20,” aimed at empowering 200,000 women by 2020. Since 2001, Pink Run has had more than 320,000 participants, donating more than 3.5 billion won ($3.2 million) worth of donations to the foundation.